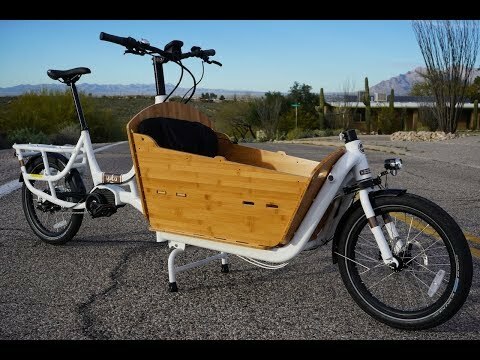 Full Review: https://electricbikereport.com/yuba-electric-supermarche-cargo-bike-review-part-1-pictures-specs/ The all new Yuba Electric Supermarché front loader electric cargo bike is in for testing & review. And wow this is a big eCargo bike with a lot to cover! There are many versatile options for carrying groceries, kids, boxes, etc. This front loader is equipped with a Bosch mid-drive, enviolo continuously variable transmission, Magura brakes, Schwalbe tires, and a well rounded accessory package. Plus there are many optional accessories to customize this eCargo bike. The Yuba Electric Supermarché is priced at $5,999 and there are monthly payment options.